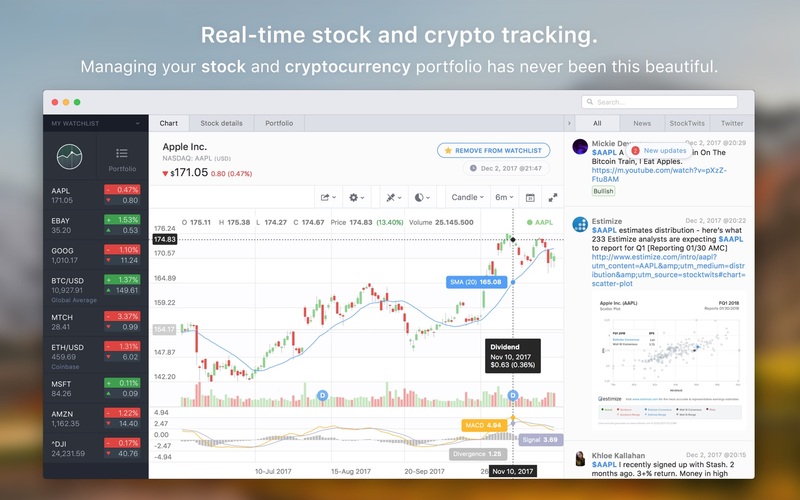 Stockfolio is an investment app for macOS that allows you to research and track interesting stocks. It is extremely easy to set up and the best way to manage and follow your investment portfolio. Track equities from around the world using realtime quotes. Get detailed charts (line and candlestick) on the price history of your stock. Watch lists allow you to monitor in realtime the stocks you own, or intend to buy. Automatically keep up to date on the latest news (RSS, StockTwits and Twitter) relating your stocks. Track open positions in your portfolio and get useful stats, such as unrealized capital gains. StockTab 1.4 – Keep an eye on the markets from your menu bar. Stock + Pro 3.8.5 – The easiest way to watch and track your investments.